Awesome new features, Pixelmator may be the Photoshop Killer! The Pixelmator Team have done all graphic artists a favor. Their new Pixelmator 3.2 Sandstone is an amazing update to its (already) fast, innovative, and powerful image editing app, featuring an all-new Repair Tool, 16-bits per channel support, and Lock Layers feature. Pixelmator 3.2 Sandstone is available today as a free update on the Mac App Store. Packed with incredible features, Pixelmator 3.2 Sandstone delivers the most empowering image editing experience Pixelmator fans have ever had ... Redeveloped from the ground up Repair Tool, 16-bits per channel support and Lock Layers feature make Pixelmator an excellent image editor that is just as fun and easy-to-use as it is powerful. Pixelmator 3.2 Sandstone features an all-new Repair Tool. Redeveloped from the inside-out, the new Repair Tool is built on breakthrough technologies that enable removing unwanted objects or image imperfections with an unsurpassed level of quality and precision. It now has three options: Quick, Standard, and Advanced repairs. These options are the combinations of sophisticated repairing algorithms aimed at achieving the best results when removing small or large objects from smooth and complicated backgrounds - all while using four times less memory than its predecessor. 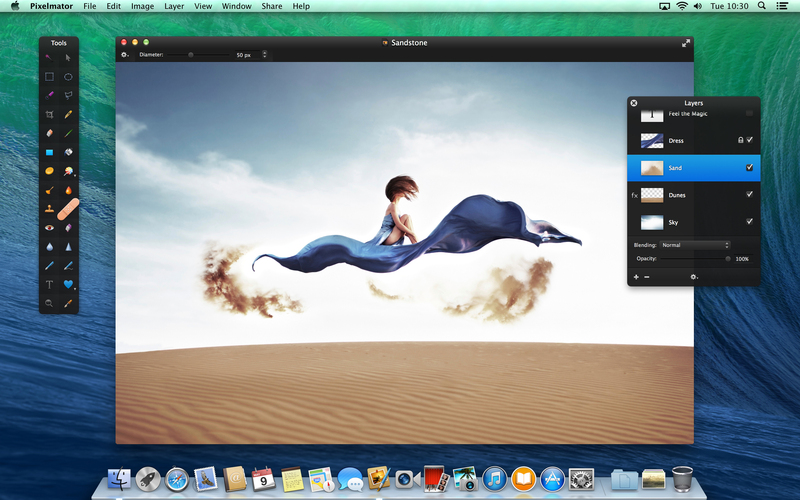 Pixelmator 3.2 Sandstone brings 16-bits per channel support to the Mac. With 16-bits per channel support, you have more color data to work with and greatly reduce the risk of color banding. This means that you can make advanced color adjustments to an image while keeping its color rich and vibrant. Pixelmator 3.2 Sandstone makes it even easier to work with large and complex compositions by bringing the new and long-anticipated Lock Layers feature. Now you can simply lock certain layers to protect their content from any further changes so that you can freely edit the rest of your composition. Pixelmator 3.2 Sandstone also includes a new Convert Selection into Shape option that lets you quickly and easily create all kinds of shapes from any selection, a number of improvements, user interface enhancements, and fixes related to stability and reliability. London, United Kingdom - Founded in 2007 by two brothers, Saulius Dailide and Aidas Dailide, The Pixelmator Team develops the world's most innovative, fastest, full-featured, and powerful image editing app for the Mac. The Pixelmator Team was honored with a beautiful Apple Design Award for Pixelmator, recognizing its outstanding achievement, excellence, and innovation in Mac app design. Along with that Pixelmator is the sole and extremely proud winner of the App of the Year award, as part of Apple's Best of Mac App Store 2011 selection. All Material and Software (C) Copyright 2007-2014 Pixelmator. All Rights Reserved. Apple, the Apple logo, Macintosh and Mac OS X are registered trademarks of Apple Inc. in the U.S. and/or other countries. Other trademarks and registered trademarks may be the property of their respective owners. Could Pixelmator Watercolor Painting Technology be the one that replaces Photoshop?